The Board of Selectmen. Taken Nov. 13. DARIEN — A new way to commemorate veterans in town is in the works. The Board of Selectman unanimously voted Tuesday night to adopt a veterans street-sign program. Lucy M. Berry, a teacher at Middlesex Middle School, brought forth the proposal to the board. Berry came up with the idea after attending a teacher conference in Washington, D.C. put together by the Friends of the National World War II Memorial. She said as teachers they were encouraged to go home and raise community awareness about the sacrifices and service of veterans. “This is a very meaningful project for me because I was raised here in Darien and have the pleasure of teaching at Middlesex Middle School,” Berry said. 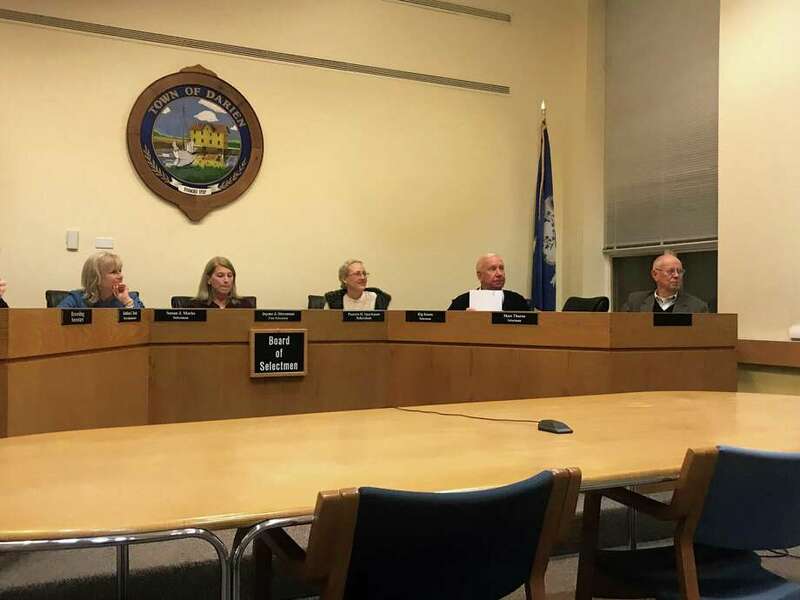 The plan would honor a wartime veteran, deceased or living, by having their name put on an existing street sign in Darien. This permanent installations would only be ceremonial and not affect addresses, Berry said. Veterans or family members of deceased veterans wishing to have a street sign can obtain nomination forms from the town’s Monuments and Ceremonies Commission. A subcommittee will review the submissions and pass them along to the full commission, and then to the selectmen for final approval. The goal is to have the first unveiling of a street sign on the Friday of Memorial Day weekend. Discussions have already taken place with the Department of Public Works and police to ensure the changes would not impact the town. Berry said the costs for the program could be covered by businesses. “I know of several private investors who have already told me they would be happy to contribute,” she said. Darien’s street-sign program mimics similar programs in other states. Berry said she spoke with a woman in a New Jersey town that has its own veterans street-sign initiative. “She said it’s just been such an amazing thing for their town because it raises awareness for the contributions and sacrifices from our own town citizens,” Berry said. Adding the street signs could also create a point of discussion for families as they drive around town, she said. “As a teacher, I know that it’s really important to teach kids about sacrifices and service,” Berry said. She suggested the information collected through street-sign nomination forms could be kept in an online database for younger residents to learn about veterans. First Selectman Jayme Stevenson said the idea was wonderful, and the numerous veterans in town could help the program grow. “We have many opportunities for a lot of street signs,” Stevenson said.